Two way radios available in today’s market can be difficult to differentiate! It’s hard to know if it’s a professional tool or a toy, they all look the same! Two way radios have some very important key factors to consider and they will be instrumental in deciding which radio you will ultimately choose. These include range, frequency, licenses, and robustness. We’ve written this guide with the express intention of making the choice between two way radios easier. No matter your needs you can choose the most appropriate option for what you want to do. Two-way radios are essential when working in construction, security and events management! With hundreds of tasks being carried out simultaneously it can be difficult to know exactly what’s going on at all times. Considerably easier than using mobile phone, two way radios keep you in constant communication and allow you to manage those tasks with much greater ease and efficiency. 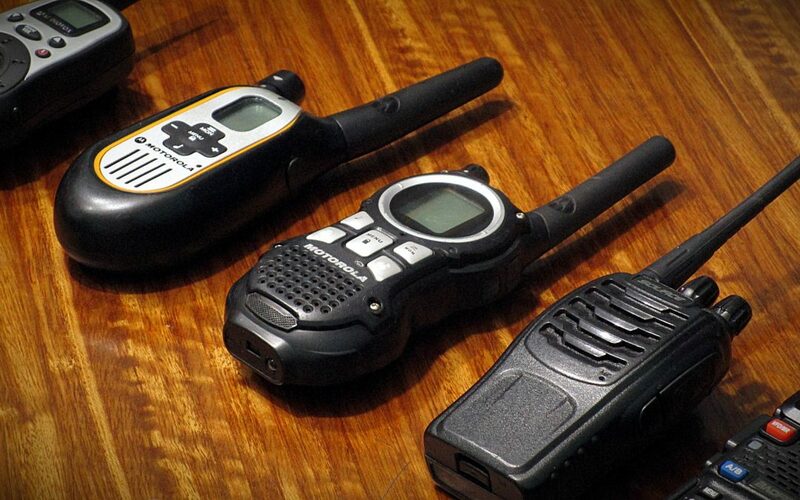 We recommend that using a two way radio for activities such as hiking camping and sailing. These environments don’t have the best mobile phone signal and carry a degree of risk involved. Therefore, having two way radios on hand can provide a better sense of security and awareness, knowing that someone is only a touch of a button away. Security is reinforced by added features such as the emergency alert buttons on certain models. The range can vary from, a few hundred metres among things up to a number of miles. The greatest limiting factors of the two way radio is the surrounding environment. The 3 mile range of a device is an open space that could be up to five times less in a packed city environment. This needs to be considered for indoor and outdoor activities. VHF is often used for long range communication in open areas, on the other hand Ultra High Frequency is better for urban area as it will better penetrate through built up areas and dense woodland. What features are needed in Two Way radios? It depends greatly on your intended usage; the following features should be taken into consideration when getting hold of a two-way radio. Construction workers will be looking for a robust radio, campers or forestry offices will be looking for a radio with a high IP rating. What are PTT and Vox Functions? Do you need hands-free communication? VOX mode (Voice operated switch) means that the microphone is active at all times, allowing you to communicate without touching any buttons, leaving your hands free for other usage. Background Noise Generally speaking, radios are equipped with either the press to talk function (PTT) or if there will be a lot of background noise when using the radios, PTT would be a much better option than VOX. Do I need a licensed radio? For most activities, unlicensed radios will do the job, as they offer a great number of channels and range. A licensed radio gives you a much wider range of communication, more channels and provides the option of privacy codes. Getting hold of a license a relatively straightforward process, and it only costs £75 for a five year license period. In an addition to this, if you get new radios in this time, they can be added free of charge. Do I need a waterproof radio? How water resistant does a radio need to be. The first thing to check out when buying a radio is the IP rating. The first of the two digits refers to a protection against solid objects, the other its protection to liquids. This information should be able to help you towards the right device to suit your needs. How robust does it need to be? If you’re planning to use the decide in challenging conditions you should consider products certified by ATEX or US MIL STD 810. Products like these mean protection from extreme temperatures and dangerous substances. All battery powered devices require a charger. Super long-life batteries can come in useful in a situation where the power supply is wholly unavailable. Perfect for noisy environments, ear defenders cancel out any background noise to allow clear communication. They also protect ears from damage that you might get from noise levels in factories, airports and construction services that can cause hearing loss. Covers and cases even with a high IP rating, a case gives your device increased protection. Useful in the construction industry in particular, handsfree kits allow you to communicate while you are working. Many radios will come with a ‘G’ shaped earpiece; however, you may require a more discreet earpiece. This is a good accessory for someone you needs to communicate frequently, you can choose from noise cancelling submersible, compact heavy duty or a standard microphone, depending on your needs. If looking to increase the range of your two way radio, independent antenna kits are available. Connection cables can mean you can link your radio to a headset. Belt clips ensure you can carry your two way radio with ease.